Really? 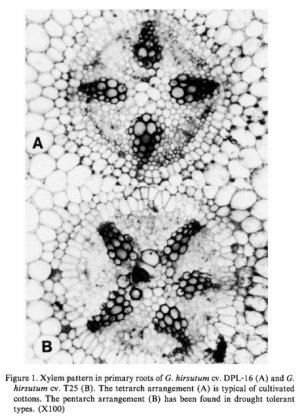 Plants Have Vascular Systems? I was checking out my trusty Cotton Physiology Handbook and have to admit that I got a bit blown away..
Plants have vascular systems just like people, but for plants, rather than moving blood through arteries and veins, plants (like my beloved cotton) move water, nutrients and energy. The xylem is the part of the system that pulls water and nutrients up. So with that, let me step back a little bit. It all starts with a top and a bottom. Logically, it makes sense. Trees and other vascular plants have a top and a bottom. The top has a trunk, branches, leaves, or needles. The bottom is a system of roots. Each needs the other to survive. The roots hold the plant steady and grab moisture and nutrients from the soil. The top is in the light, conducting photosynthesis and helping the plant reproduce. You have to connect the two parts. That’s where xylem and phloem come in. The xylem of a plant is the system of tubes and transport cells that circulates water and dissolved minerals. As a plant, you have roots to help you absorb water. If your leaves need water and they are 100 feet above the ground, it is time to put the xylem into action! Xylem is made of vessels that are connected end to end for the maximum speed to move water around. They also have a secondary function of support. When someone cuts an old tree down, they reveal a set of rings. Those rings are the remains of old xylem tissue, one ring for every year the tree was alive. I wish I could find some old photos I took when I was in the field with one of the company’s soybean breeders because the photos showed a disease that shut down the vascular system, basically starving the plant. No they were awesome pics, but they came to mind. LOL. Phytosynthesis is a process we all learned about in grade school. It’s the way plants convert sunshine into energy. Again, Biology4Kids basic explanation of phloem makes this understandable. Most plants have green leaves, where the photosynthesis happens. When those sugars are made, they need to be given to every cell in the plant for energy. Enter phloem. The phloem cells are laid out end-to-end throughout the entire plant, transporting the sugars and other molecules created by the plant. Phloem is always alive. Xylem tissue dies after one year and then develops anew (rings in the tree trunk). What is the best way to think about phloem? Think about sap coming out of a tree. That dripping sap usually comes from the phloem.